The funny season is on its way - for the first time ever in our surveys, a British Airways flight is the cheapest! BA are cheaper than any of the low-cost carriers - 1time, Kulula, Mango or Nationwide. We looked at flights from Johannesburg to Cape Town leaving on the evening of the 14th December, and British Airways flight BA6435 leaving Johannesburg at 2000 and arriving in Cape Town at 2210 is the cheapest (at R867). With British Airways having the cheapest flight, that leaves SAA as being the only airline we have surveyed which has not achieved the feat of cheapest flight. We haven't made a secret of the fact that we think that British Airways have the edge over SAA. If BA are the cheapest then you've got the best of both worlds, what is not meant to be economically possible - best airline at the lowest prices - luxury at low cost. Last week we had an SAA pilot pulling a handbrake turn on Cape Town's runway, then a Nationwide engine falls off the plane on takeoff, now this week a Kulula flight from Johannesburg to Cape Town returns on one engine. Seems much of what we write about these days are dodgy incidents. SAA Technical, who look after all three airlines (Nationwide, SAA & Kulula) are under the spotlight. Comair (which owns Kulula airline and the British Airways brand in South Africa) has taken a step closer to realising its dream of operating flights from South Africa to the UK. 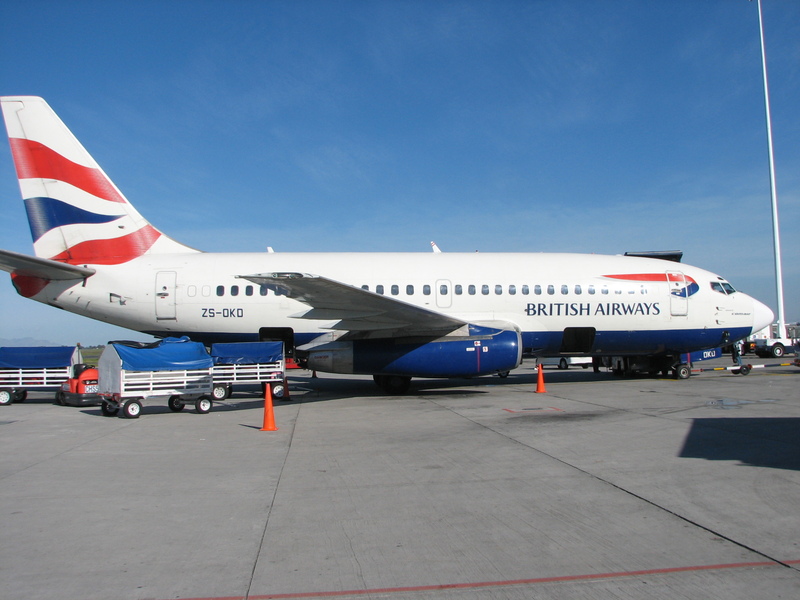 the International Air Services Licensing Council awarded Comair 4 flights to the UK each week, Comair hopes to increase frequencies to 7 flights a week over time. They plant to start operating flights to the UK in 2008, but haven't yet disclosed where in the UK they'll be flying to (probably London) and whether they'll be using the Kulula or British Airways brand (our guess is Kulula with an all economy class configuaration). Currently BA has 21 flights a week between South Africa and London, South African Airways 21, Virgin Atlantic 14, and Nationwide airlines has 4 (between Johannesburg and London). An American reflects on his times in South Africa. After an uneventful flight from London to Johannesburg, he catches a flight from Johannesburg to Cape Town which is diverted to George as a result of the Nationwide airline emergency landing (on which page one of the passengers of the plane left a message this week). He goes go-kart racing against Germans and Brits and sees the wineries (Meerlust, Rust en Vrede and La Petit Ferme). "I had a once in a lifetime experience in South Africa". Frank Walker tells the Sydney Morning Herald about a night spent in Soweto. "Orlando West, a suburb that would not look out of place on the outskirts of Canberra." Frank walked through Vilakazi Street, the only street in the world that has been home to two Nobel Peace Prize winners (Nelson Mandela and Desmond Tutu); he ate traditional african cuisine and saw the Hector Pieterson memorial. Flying from Nairobi to Johannesburg? Don't forget to take your yellow fever shots. These travellers tells us about their flight from Nairobi (Kenya) to Johannesburg, taking in the views of Mount Kilimanjaro and Mount Meru as they flew over Tanzania. And their thoughts about Johannesburg: "The taxi from the airport to our hotel only cost $50", "The purple lacy Jacaranda trees are in full bloom, "The 20 hour overnight train from Johannesburg to Port Elizabeth on the east coast was great". And their thoughts about Cape Town (after their drive from Port Elizabeth to Cape Town): "The wine country looks much like the Napa Valley in northern California", "We were reminded more of the San Francisco Bay area than any other place we’ve visited", "the most beautiful botanical gardens in the world" and "the beer consumption could support a village". You must fly Air Emirates! This traveller tells us about his experiences in Cape Town recommends flying Air Emirates, "Did you ever fly "Air Emirates"? You definitely should!". He recommends reading the history of South Africa, "Indeed, it is quite a brutal one...". His thoughts on Cape Town: "Cape Town is not such a dangerous city like Johannesburg", "You'll find out that you have some maybe racist thoughts: Black people on the street increases your alterness. ", "please read about Cape Town, then Table Mountain and Robben Island". How does one get from Cape Town to Busanga? The Gleasons caught a flight from Cape Town to Johannesburg, and from Johannesburg to Lusaka (Zambia); both with South African Airways. Then flew from Lusaka to Lunga Airstrip with a 4-seater plane, and finally from Lunga to Busanga witha helicopter. If you enjoy seeing Lions in the wild then the trip looks like it's worth it (they share several photos on their blog entry ). In light of the fact that Jet Airways are planning to operate flights from Mumbai to Johannesburg from April 2008, we are now covering flights from Mumbai to Johannesburg. Jet Airways have also expressed interest in operating flights from Mumbai to Durban. Our international site is now covering flights from Glasgow to Ireland West Knock Airport (bmibaby is the only airline operating flights on the route, starting from February 2008). At long last we have also updated the page on Flybe Airline flights to include all flight routes that Flybe airline is taking. Well done British Airways - for the second week in a row BA has the cheapest flight from London to Paris. A Flybe airline flight from Birmingham to Stuttgart turned back to Birmingham 15 minutes into its flight after noxious fumes drifted into the cabin. Flybe intends to ground all its BAE 146 planes by February 2008. "Air France were in denial; they thought that if they woke up it would all have been a bad dream." Extract from Alan Ruddock's book, "A Life in Full Flight: The story of the man who made Ryanair take off".